Frameless mirror design is attractive in any bath. Finished in dark espresso, the Gazette 22 in. poplar framed medicine cabinet has a distinctively modern feel. The attractive medicine cabinet features the Secure-Mount hanging system for easy mounting and levelling. It is capable of being hung with a right or left hand mirror swing. In addition, it includes two adjustable hinges and shelves for customization to suit your needs. Screws, anchors and shelf pins are conveniently included. The Glacier Bay 24 inch x 29 inch mirrored cabinet features a Bi-view bevelled frameless door that can be installed with hinge. As functional as it is stylish, this cabinet opens almost flush to the wall and has 3 adjustable glass shelves for plenty of storage and a mirror on the front, on the inside and on the side. Easy to install with a hanging kit included, this cabinet can either be recessed or surface mounted and will provide years of use and enjoyment. Limited Lifetime Warranty. 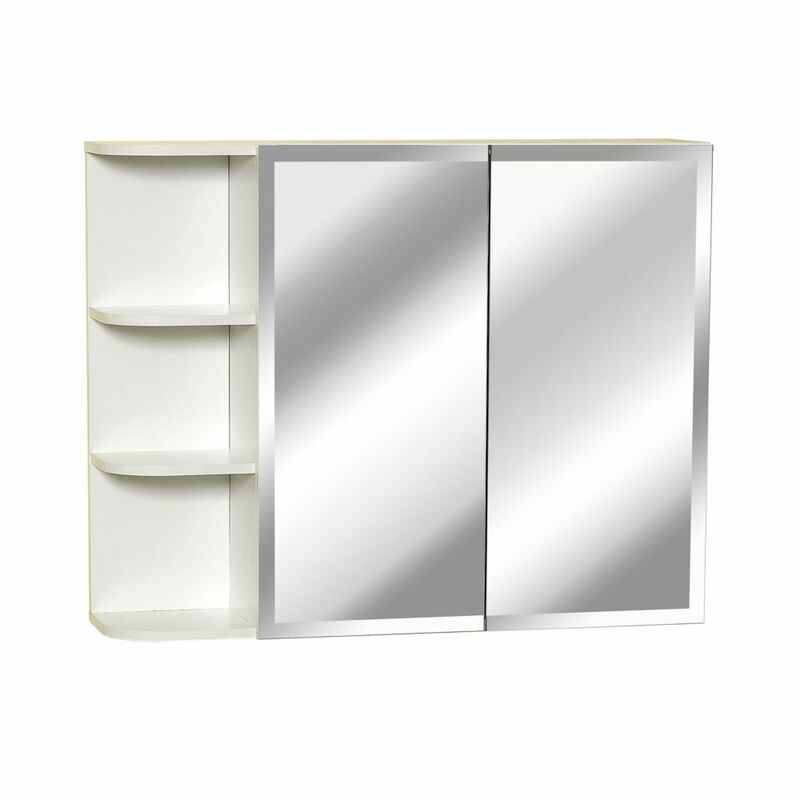 31 Inch Bi-View Medicine Cabinet With Side Shelf Frameless mirror design is attractive in any bath. 31 Inch Bi-View Medicine Cabinet With Side Shelf is rated 1.0 out of 5 by 4. Rated 1 out of 5 by John Jacob from Not recommended Cannot believe the price for this cabinet compared to the quality. The back is made out of cardboard that is barely big enough to nail to the back. Ended up splitting the particle board that I nailed it to since it was so small. Not the cabinet's fault, but it ended up being too deep to be practical in our setting. Sticks out from the wall too much and have to make sure you don't bang your head on it. Rated 1 out of 5 by Rusty from Poorly constructed This medicine cabinet is made of cheap particle board and the back is a piece of cardboard. It is not worth the money I paid for it. I will not buy another medicine cabinet from Home Depot. Rated 1 out of 5 by BradBrad from Don't Buy bought this cabinet, first problem was it was missing one entire panel. After waiting weeks I got the replacement panel in the mail. The entire assembly was made difficult as some of the holes were not drilled out completely. instructions were confusing and left out entire parts of its assembly. Doesn't even come with screws or anchors to mount it to the wall..... cabinet is of very poor quality and is pretty much only good for fire wood. Rated 1 out of 5 by Hase from Poor quality This cabinet looks like a grade 8 shop class built it. Holes are miss drilled, the white finish comes pre-chipped. Comparable to a Swedish cabinet but the Swedish cabinet is way better quality. Thank you for your inquiry! Unfortunately, we will need a little more information to be able to assist you with your issue. If you could call the manufacturer's Customer Service Department at 1-800-892-3986 to explain what's happening, we are sure they will be able to offer you a solution. Thank you.